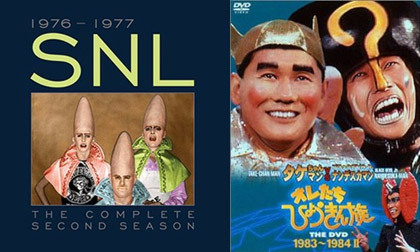 Japan will finally, and formally, have its own version of “Saturday Night Live.” Starting June 4, Fuji TV will air a show using the same live format as the legendary late-night NBC comedy show that launched the careers of so many top comedy stars. It will air once a month in the 11:10pm time slot. The regular lineup will be led by top comedians Akashiya Sanma (55, profile) and Imada Koji (45), the inaugural host will be Okamura Takashi (40) of the comedy duo Ninety Nine (profile), and the first musical guest will be crooner Hirai Ken (39). SNL has been a breeding ground for comedy talent since it first aired in 1975. It has launched the careers of such names as John Belushi, Bill Murray, Eddie Murphy, Mike Myers and Will Ferrell. It has been aired in over 130 countries, and in Japan it is said to have inspired the legendary show “Oretachi Hyokinzoku.” That show in turn made household names of Sanma and Kitano “Beat” Takeshi (64).